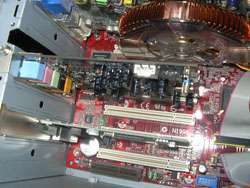 Ever have to test out a Fan or HDD to see if they power up or not? Well, it can be a pain to open up your computer to get at the connections to do so. AC Ryan has made this exact problem much easier with their Backy. Read the review to find out more. AC Ryan has been around for a few years, pumping out quality Modding supplies. Arguably, they are most known now for their RyanPower2 fan less PSU. They are also well known for having some of the most unique product names.. ever! The product we are reviewing today, is the Backy. An appropriate name as you will soon find out. So let’s get to it! The Backy’s main purpose, is to give you quick access to Molex connections so you can test components without having to go inside your case. This is a great idea if you are a modder especially, since you may have parts lying around, and you are not sure if they work or not. Something like this would also be perfect if you regularly fix peoples computers, since this gives you an easy way to test their components to make sure they are powering up. The Backy comes in a few different versions, as you can see listed below, and as well on the AC Ryan site. The version I reviewed is a Blue UV color, which will glow under a CCFL light. 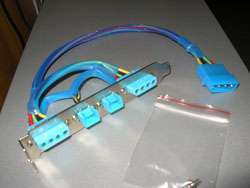 This Backy has two standard four pin Molex connections, which are the ones we use for Hard Drives, CD-Roms and some other peripherals. 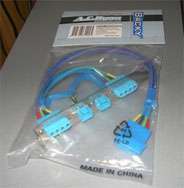 It also includes two 3 pin connections that are primarily used for fans. The Backy was one of the hardest products I have ever installed. [/end sarcasm] The installation of the Backy could not have been any easier. 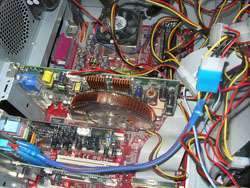 It’s a matter of plugging it in to an available slot, screwing it in place, and plugging in the Molex connection. Unbelievably easy.. anyone can do it. The only fault I found in the installation, is that the screw they provided did not secure the Backy very securely to my case. Whether this is just my current case [Logisys Case-51] or not, I am unsure. Luckily, like any computer geek out there, I have so many spare screws, it’s nuts. No pun. So, I grabbed a larger screw, similar to ones you use to secure your motherboard or IDE devices to your chassis. After everything was in place, the case went back together. Very hitch less install if I must say so.